In the old days of boxing, there were only eight weight classes. Half divisions did not exist. If you weighed in at between 148 and 160 pounds, you were a middleweight. In general, I do not have a problem with the existence of half weight classes. It makes sense in today’s world of super precise sport’s medicine and nutrition. But one thing about the old days–you did not get the sort of soap opera drama we have had this year around Gennady Golovkin and Saul Alvarez. In previous eras, there would have been no posturing about when or if Alvarez would finally move up from 154 to 160 pounds. He is not a welterweight. In the old days, to be a world champion, he would have had to fight Golovkin. With Golovkin’s fight last weekend and Alvarez due for a return to action this weekend, here is a look at the top five fighters between 154 and 160 pounds. 1. 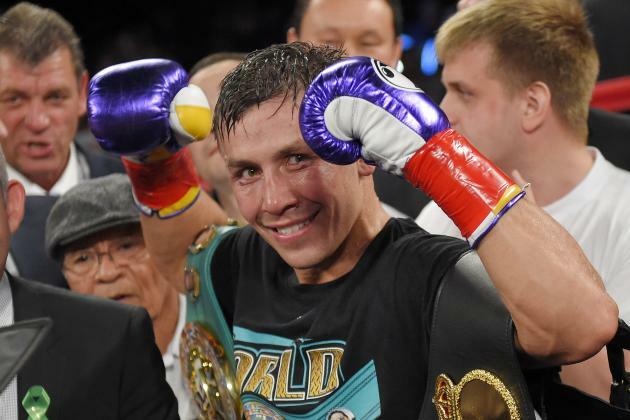 Gennady Golovkin He might not have the same level of big-names on his resume as Canelo, but he has knocked out 23 straight, including a large number of top-10 contenders. 2. Saul Alvarez Alvarez has twice defeated the other best fighter in the junior middleweight division, edging Austin Trout and Erislandy Lara in close fights. He has wins over a pair of future Hall of Famers in Shane Mosley and Miguel Cotto, though both were past their prime. 3. Erislandy Lara I had Lara winning against Alvarez in July 2014 and he was straight-up robbed against Paul Williams in July 2011. The Cuban technicians defensive style does not play well with judges, though, or with fans. Still, I think he would have a very good chance to beat anybody between 148 and 160 pounds. 4. Daniel Jacobs Jacobs should be next up for Gennady Golovkin and count on him to give GGG the toughest fight of his career. His KO of Peter Quillin last year was one of the year’s best. 5. Demetrius Andrade The 2008 Olympian has had a career of starts and stops. But based on pure talent, he might be the best on this list. At 6’1″ and with a 73.5″ reach, he is very big for a junior middleweight and imposing at a full 160 pounds. Turned in a terrific knockout of tough contender Willie Nelson last June.